Shellfish farming is a significant and growing aquaculture sector in Scotland feeding demand in a growing market both in the UK and abroad. It is a low-impact, sustainable industry producing a range of different products. The majority of production is centred on mussels but oysters and scallops are also grown. Farming typically takes place in sea lochs and voes on the West Coast of the Scottish Mainland, in the Western Isles and Shetland, with the indented irregular coastline of Scotland offering many ideal sites for shellfish production. The critical requirement is the need for pristine clean water in which to grow wholesome shellfish. At the moment most mussel cultivation in Scotland is achieved by growing the mussels on vertical single ropes or fabric, suspended in the water from heavy horizontal ropes and flotation buoys arranged in long lines normally parallel to the shoreline. Scallops can be grown in a similar fashion, hanging from lines or grown in small suspended net enclosures known as lanterns. Oysters are normally grown in bags made from heavy plastic mesh, either lying directly on the shore or set up on platforms known as trestles. The shellfish species cultivated in Scotland are all filter feeders from the group known as bivalves - their soft bodies being enclosed between two shells. The animals feed by opening a gap between the shells, drawing water containing plankton in and exhaling the water having filtered out the plankton and other food particles. The shellfish do not need to be fed by the shellfish farmer, being entirely dependent on these naturally occurring foodstuffs from the sea. 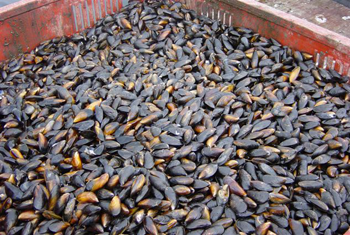 In a similar fashion, mussel farms are populated by young larval mussels known as spat arriving naturally in the tide and settling on the ropes in the shellfish farm. The natural stocking and feeding means that shellfish farming is considered to be highly environmentally sustainable.